The influential Japanese horror returns to UK cinemas in a new restoration. Few horror movies have proved as influential as director Hideo Nakata's Ring, which kicked off a craze for Asian horror movies and saw Hollywood remaking every Japanese and Korean horror movie execs could get their hands on. And all those pesky crawling, lank-haired ghost girls that have been populating horror over the last two decades? Blame Nakata. The story famously involves a mysterious VHS tape that plants a curse on anyone who views it, giving them a week to pass on the curse by showing the tape to someone else, thus preventing their own death. As recently as last year saw the release of Rings, a hackneyed late Hollywood instalment in the franchise. Now you can experience the original on the big screen on March 1st in a new 20th anniversary restoration. Visit RingFilm.co.uk to find your nearest participating cinema. 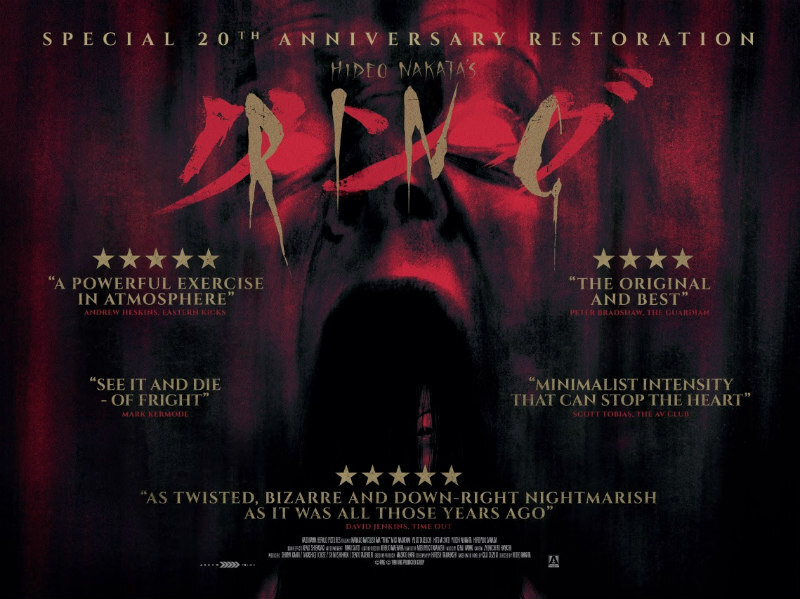 The cinema release will be followed with a home entertainment release on March 18th, when Ring will be available on Digital, DVD, Blu-ray, in a Limited Edition Steelbook, and as part of a Limited Edition collection featuring Ring, Ring 2, Ring 0 and Spiral. The blu-ray features a new audio commentary by film historian David Kalat; interviews with critics and filmmakers on their memories and the enduring legacy of the Ring series; and a video interview with author and critic Kat Ellinger on the career of Nakata. The Limited Edition collection comes with a 60-page booklet containing new writing by Violet Lucca, Alexandra Heller-Nicholas, Jasper Sharp, Kieran Fisher and Ellinger, along with video essays by Heller-Nicholas and Sharp.